The grand opening for the new Tsawwassen condos for sale at the luxurious Solei Terrace community will be coming soon on May 1, 2010! Special pre-sale Tsawwassen condo pricing will be available for the first homebuyers. This is a community like no other with 32 quality built Tsawwassen Solei Terrace condominiums available to the general public and priced affordably from $289,000 to $349,000. These spacious floorplans at the pre-sale Solei Terrace Tsawwassen Condos for sale will be between eight hundred and eighty square feet to nine hundred and five sq ft in size. From granite countertops to stainless steel appliances in the kitchen and from standard hardwood flooring in living areas and private terraces, these new Tsawwassen Solei Terrace condominiums will be a step above the rest of its competition. In addition, the living spaces will have eight to nine foot ceilings in addition to one parking stall per purchaser and one storage locker. With ocean views, luxurious interior finishing and two bed and two bath floorplans, the new Tsawwassen condos for sale at the Solei Terrace community will be absolutely stunning in every way. Solei Terrace Condominiums are located at 5599 14B Avenue, Tsawwassen, BC. The condo project is marketed exclusively by Sutton Centre Realty, and you can VIP register by calling 604.254.6356 or by visiting www.soleiterrace.com for all the details. Brand new Tsawwassen condos are coming to the market place right now, with thirty quality built environmentally friendly condominiums for homebuyers to choose from. The Solei Terrace Tsawwassen condos offer an exciting and exclusive collection of new homes with a perfect balance of functional floorplans, urban interior finishes and great architecture. Located between the beautiful beaches and parks of this city and the Tsawwassen Town Centre, the Solei Terrace condos feature attention to detail everywhere you look in addition to affordable pricing that is unmatched by any other new Tsawwassen real estate development of this kind. The presales Tsawwassen Solei Terrace condos is happening on May 1st, 2010 at 12:00 noon on site, so make sure you swing by and check out the display suite, finishing details, floorplans, availability and pricing. Marketed exclusively by Carlo at Sutton Centre Realty, please call 604.254.6356 for additional details leading up to the grand opening presale Tsawwassen condo event at Solei Terrace. Very close by is Grauer Park, the waterfront district of Beach Grove, Beach Grove Golf Course and Tsawwassen Golf Club. Here is more information about the new Tsawwassen condos: each of the units during the grand opening event on Saturday, May 1st (12 noon at the presentation centre) will include 1 secure parking stall and 1 secure storage locker. Other features of the pre-construction Tsawwassen Solei Terrace condominiums for sale will include stainless steel appliances, granite countertops and porcelain tiling in the bathrooms and kitchen. Additional features at Solei Terrace pre-construction Tsawwassen condos for sale include open spacious layouts (all units are two bedrooms and two full bathrooms – see below) in addition to having 2 designer colour palettes for homebuyers to choose from. With mountain and sunset views, the new Solei Terrace Tsawwassen condominiums will also feature spacious floor plans between 840 and 905 sqft). There are engineered hardwood floors in the main living spaces in addition to berber carpets in the bedrooms. All new Tsawwassen homes for sale at Solei Terrace condos will come with the New Home Warranty and will be located in the fabulous City Centre location that is minutes away from the Ferries to Victoria/Vancouver Island as well as the Gulf Islands. Best of all, the pre-construction Tsawwassen condos for sale will start from just $289,000 plus taxes. Located at 5599 14B Ave, Tsawwassen, BC, the Solei Terrace condo floor plans have been released online for your previewing (actually, they are full floorplates of the condominium building). As you will see, all of the Tsawwassen condos will have outdoor living spaces, and the functional and well laid out floorplans will give you plenty of space to grow and store all of your belongings. On the main floor of the Solei Terrace Tsawwassen condo floor plans, you will see a wide selection of two bedroom and two bathroom layout that range from eight hundred and seventy one to nine hundred and five square feet (not including the outdoor terrace space). Fronting by 14B Avenue and 56th Street, these new Tsawwassen condos are ideally located on a quiet strip close to the beaches, waterfront and local amenities/services that you can walk to and from. 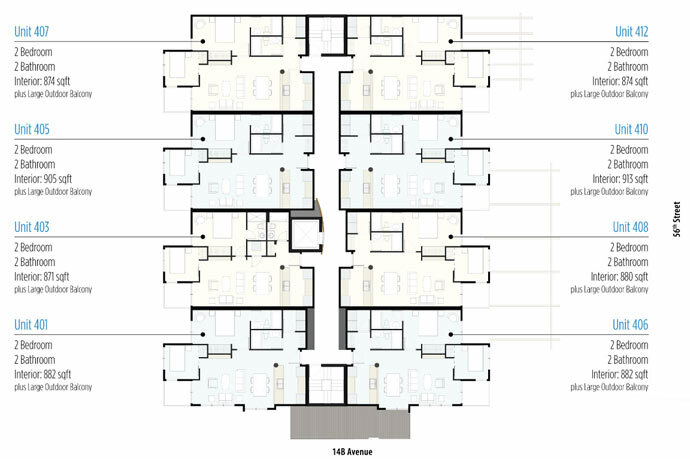 The remaining second, third and fourth floors (which represents the penthouse suites at the Tsawwassen Solei Terrace condominium building) are of the same floor plate design. The corner suites include 874sf and 882 sf floor plans with two full bathrooms, in suite washer/dryer laundry closets and great views. For more details about the grand opening launch of this new Tsawwassen real estate development, please register your interest on line at www.soleiterrace.com or call the exclusive marketing agents preparing for the VIP Preview in May 2010. A rare opportunity to purchase a brand new Tsawwassen condominium, Solei Terrace commences presales on May 1st, 2010! The thirty two suites available are priced between $289k to $349k and features high-end finishes that include granite counters, hardwood floors, private terraces and ocean views. The Solei Terrace Tsawwassen condos are located centrally between Town Centre and the serenity of parks and beaches and is found at 5599-14B Ave. Remember that the Solei Terrace Grand Opening VIP Pre-Sales event is happening at the presentation centre on May 1st at 12 noon. Not many new Tsawwassen condo developments are in the market, so when a project such as the Solei Terrace boutique condominiums comes up, there is much interest and anticipation surrounding the opening of pre-sales. With more sunshine than any other locale in the Lower Mainland, Tsawwassen real estate market is highly sought after for both the sunshine as well as its affordability. With only a handful of new condominium style developments in the location, the new Tsawwaseen Solei Terrace condos are a unique breed, featuring affordable sunny condo residences that are perfect for new homebuyers as well as downsizers, couples, singles and even families. The brand new Tsawwassen Solei Terrace condos feature only an exclusive selection of 32 homes with wow factors that include the spacious floor plans (all are over 800 sf) plus open style layouts. In addition, the standard features at the pre-sale Tsawwassen Solei Terrace condos include such finishings as granite, quartz, stainless steel and fine detailed craftsmanship for the modern and contemporary interiors. Energy and water efficiency are also other key selling features here. Not only that, but the sunny Tsawwassen real estate location is impeccable. Being just minutes away from the US Border, Point Roberts, big box retailers, local shopping, dining and services, the Solei Terrace Tsawwassen condos for sale are also close to the BC Ferries, major highways and tonnes of recreational options for all ages. The grand opening is happening in May 2010, so make sure you pre-register online for VIP sales pricing at the new Tsawwassen condos for sale that start from less than three hundred thousand dollars. Contact Carlo for more details.